Amazon has a tendency to list items far in advance of their release, often giving prospective buyers their first look at book covers and descriptions. This weekend, our friend Martin over at Upcoming Pixar came upon the next installment in the great “Art of” series published by Chronicle Books. “The Art of Brave” is currently set for release in June and comes in at 160 pages. The preliminary cover art features Princess Merida clutching a sword and shield. It is, as always in the case of these books, a stunning look behind the scenes of the film. Take a look at the cover after the jump. The cover art often changes before final release, so for now, simply enjoy the beautiful artwork. A huge version of this art is currently hanging in the recently-opened Brooklyn building on the Pixar campus. The art was also seen at the D23 Expo during The Art of Brave panel. Many have noted that the images and trailers we have seen thus far display gorgeous settings and fantastic character work (just look at the way Merida’s hair moves in the newest trailer). The many pieces of art we were lucky enough to see at D23 this far before the release of the film was a pleasant surprise and confirmed that we haven’t seen anything yet! Brave is Pixar’s first fairy tale, a lush, animated adventure through the forests, heaths, and highlands of medieval Scotland. Featuring behind-the-scenes interviews with the film’s many artists, The Art of Brave also showcases the gorgeous concept art that went into the creation of the movie, including colour scripts, storyboards, character studies, environment art, sculpts, and more. 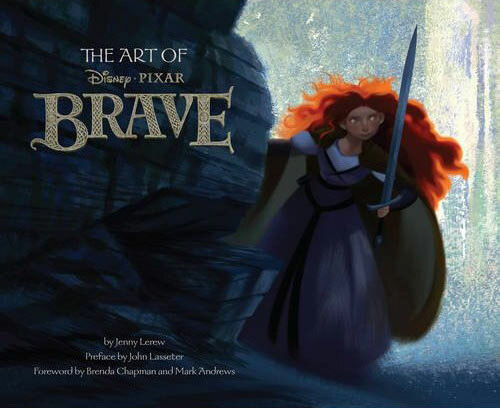 “The Art of Brave” is being authored by animation story artist Jenny Lerew (How To Train Your Dragon). The hardcover also has a forward by directors Brenda Chapman and Mark Andrews, as well as a preface by Pixar Chief Creative Officer John Lasseter.